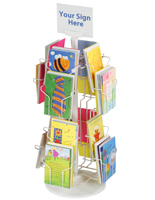 This Greeting Card Display has a Compact Design Great for Busy Stores, Get yours Quickly, Order by 1pm EST and it will Ship Today! Rotating countertop spinners is easy to browse! 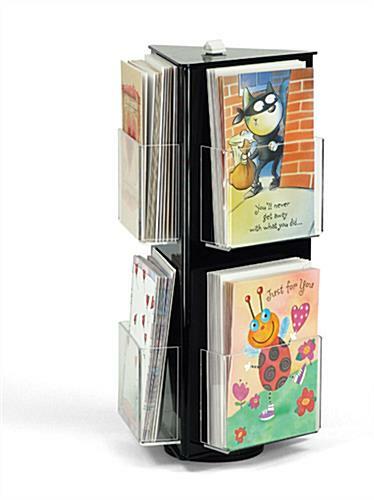 Fits 5" x 7" standard cards. Comes in clear acrylic with glossy black base. Simply a great looking unit! 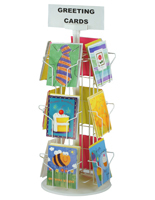 These greeting card displays are perfect for showing off your latest and greatest merchandise. 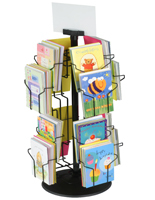 These store fixtures are revolving to make it easy for customers to see all of the selections, quickly. 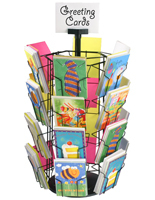 These greeting card displays are great for customers to peruse for wedding, anniversary, birthday and "just because" cards. 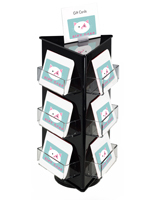 These fixture setups, retail display kiosks have (6) colorless acrylic pockets that that fit 5" x 7" cards. 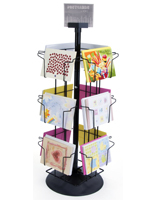 These greeting card displays, also known as countertop spinners, are made of modern black acrylic. 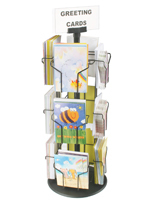 These store fixtures rotate so they are easy to browse and easy to load. 7.5" x 16.8" x 6.5"
5.1" x 4.0" x 1.5"